Love stories between two women remain a rarity on our stages. For this reason alone, Lucy Foster’s Lobster is a welcome addition to the fringe theatre scene. But it’s an oddly flimsy thing, the characters, and the situations they find themselves in, never ringing true. After running into each other at a party, J and K recall the trajectory of their relationship, from their first awkward dates through the early flush of love to their eventual breakup. The two are pitched as emotional opposites. J is needy, simultaneously perky and passive, and has a deep desire to have a child, while K is prickly and commitment adverse, with no real wish to have a family. Their different stances on marriage are briefly explored but it’s all done with a heavy hand. A lot of the writing is quite clunky – a tertiary character, for example, is briefly introduced only so that she can be killed off. The play’s failure to fly is not the fault of Louise Beresford and Alexandra Reynolds. 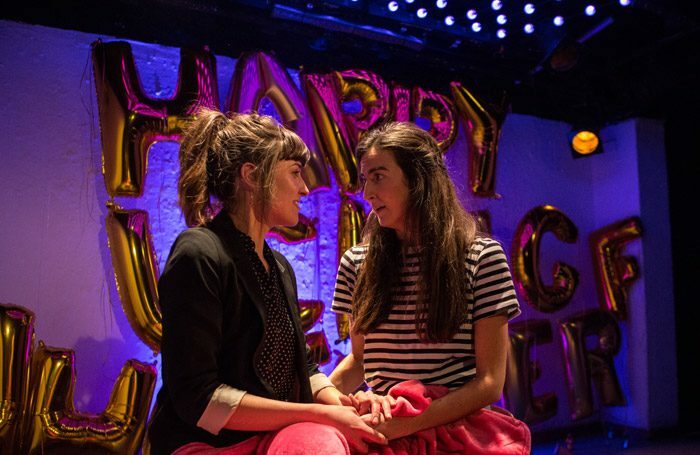 They both give committed performances, Jamie Simmonds’ helium balloon set is eye-catching, and Foster’s play contains moments of emotional acuity. 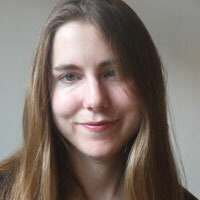 But neither the writing nor the performers are particularly well served by Kayla Feldman’s production. Lobster strives for both millennial resonance and romcom cuteness, the soundtrack peppered with soppy songs, but doesn’t really work on either level. It all ends up feeling incredibly affected and the frequent use of direct address also creates an emotionally remoteness which seems at odds with the story it is telling.